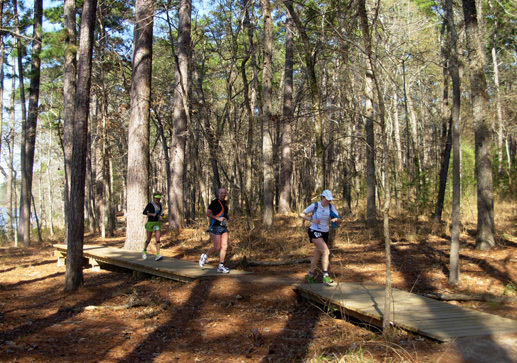 Rocky Raccoon Trail Run. 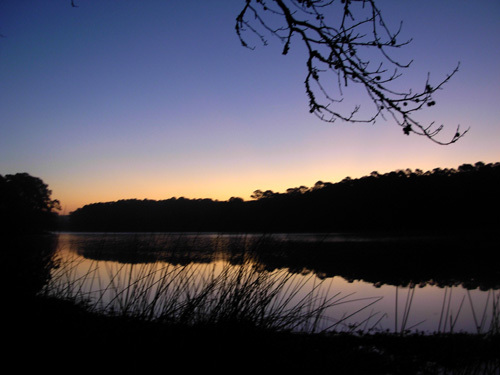 It is our intention to provide the very best Texas hospitality . 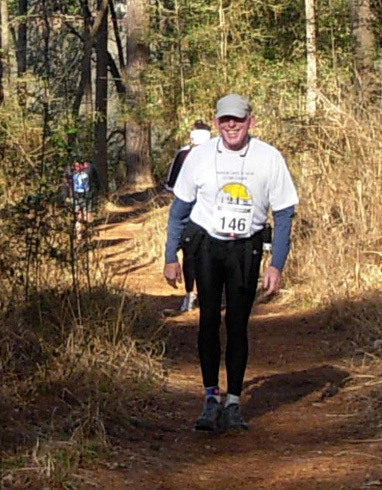 . ."
Although both Jim and I have run the Sunmart 50-miler at Huntsville State Park, we have never participated in Rocky Raccoon. 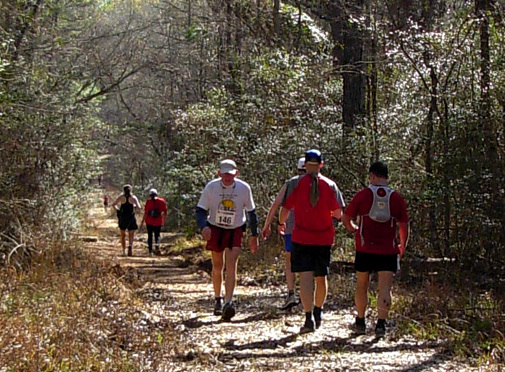 The races are sponsored by different groups; they share only the same venue and trail system. Both of us have concentrated our 100-mile efforts in the past mostly to the more difficult Western mountain regions at races renowned for their scenic vistas, difficult terrain, gobs of elevation gain and loss, and/or high altitudes -- Leadville, Bighorn, Western States, Wasatch, The Bear, Grand Teton. Even Vermont and Rio del Lago have a fair amount of elevation gain and loss at lower altitudes. 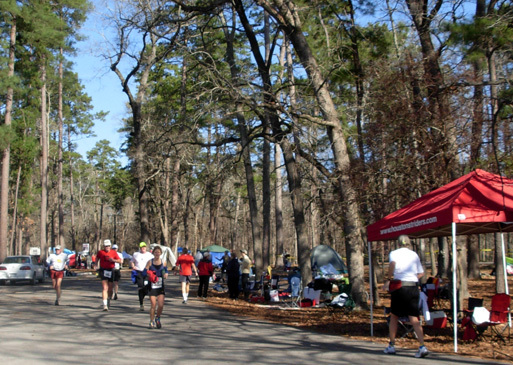 The least hilly courses we've run are Arkansas Traveler, Kettle Moraine, and Umstead. Even those have more elevation gain and loss than Rocky. Rocky is considered to be among the "easiest" (comparatively!) trail hundred-milers. It is a relatively flat and fast course, undulating just enough to use different muscle groups. Of course, running and walking a hundred miles is NEVER easy, whether you're in the front of the pack. the back of the pack, or somewhere in between. The distance alone, regardless of all the other variables you find over the span of a hundred miles, will tax your system. We've avoided these "easier" courses most of the time simply because we love to run in the mountains so much, not because they weren't challenging enough. 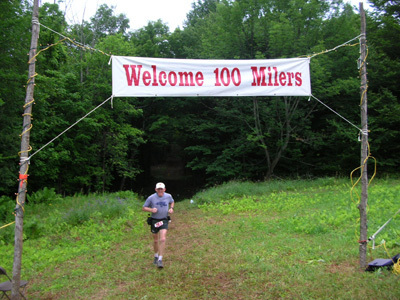 My second and last 100-mile completion was 'way back in 2000 at Vermont, although I consider the 75 miles I ran recently at Across the Years (photo below) in under 23 hours to be almost as good as a 100-mile trail finish in 28� hours, the time in which I completed Arkansas Traveler and Vermont when I was almost a decade younger. Now my Granny Knees and our decreasing speed / advancing ages are threatening to erode the ability of either one of us to finish ANY hundred-miler, even the "easy" ones. 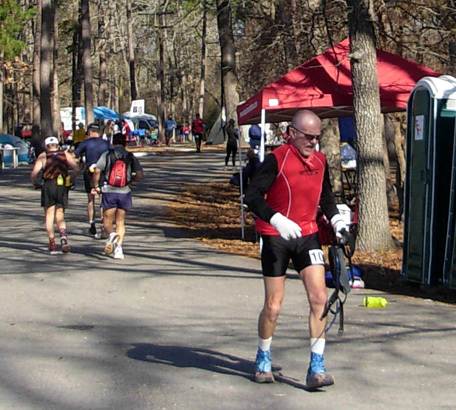 Jim bailed out early last April at Umstead, also considered fairly easy, taking a 50-mile finish instead of pushing on for 100. He was disappointed in failing to reach his goal of 100 miles at Across the Years 24-Hour Run in December and decided within ten days afterwards that the 75 miles he did in 22+ hours was "good training for a 100-miler." When he said that during a training run I thought a few seconds and responded, "Why don't you run Rocky Raccoon?" Guess that makes me an enabler! The stars aligned: the timing for Rocky was good, we could hit it on our way back home from Phoenix, and wonder of all wonders, there was no limit to the number of entrants. That's becoming more and more rare in the world of ultra marathons, especially with popular 100-milers. How popular is Rocky?? 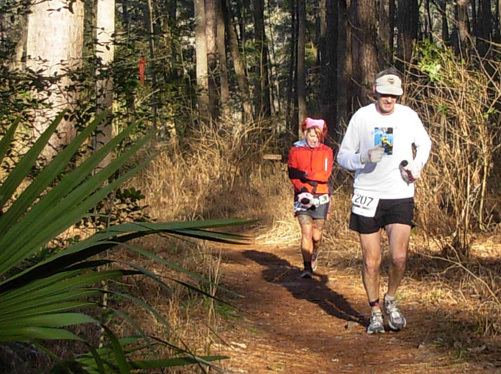 There were over 500 entrants this year in the 50- and 100-mile races. It's not the biggest ultra, but it's right up there. Two hundred fifty-two runners started the hundred, the highest number in the event's sixteen years. One hundred sixty-eight finished, tying last year's record number of finishers. However, because fewer people started the race in 2007, this year's finish percentage (66%) was lower, the second lowest since the race began. Why? Probably that heat and humidity I mentioned in my last entry. The high was a balmy 72� F. and the low was only 43� F. It was sunny and muggy during the day on Saturday and Sunday and some rain fell during the night hours. If you'd been training all winter in the North, or most anywhere else in the country, you weren't prepared for that! I warned several runners early in the afternoon that they were already getting sunburned. Jim had an advantage. He's been training (and tapering) the past six weeks in somewhat mild 50-60-degree temperatures in Arizona and Texas. That helped, but it didn't make the race "easy" by any means despite its mostly-good footing, low elevation, few hills, frequent aid stations, and repeat loops. It was still a hundred miles, after all, and that's NEVER easy! Did I mention this is also a rather low-key race, despite its large size, with fewer "do this, don't do that" rules than most other 100-milers?? 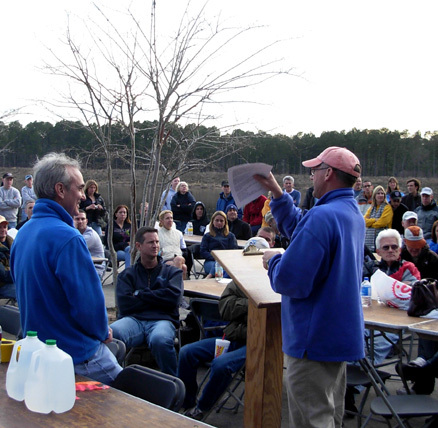 RD Joe Prusaitis did follow the race schedule for all activities before, during, and after the race (briefings, drop bag deliveries, meals, awards ceremony, etc.) but attendance by the runners was more optional than in many 100-mile races. Joe expects the runners to assume personal responsibility for knowing (and following) the rules and monitoring themselves during the race. As he says on the web site, "If there is anything I missed, please call or send an e-mail. I want to know what you think. I will repair what I can, adjust what makes sense, add in new ideas, and remove what should be gone." Not all RDs are that flexible or open to suggestions! I like this guy. 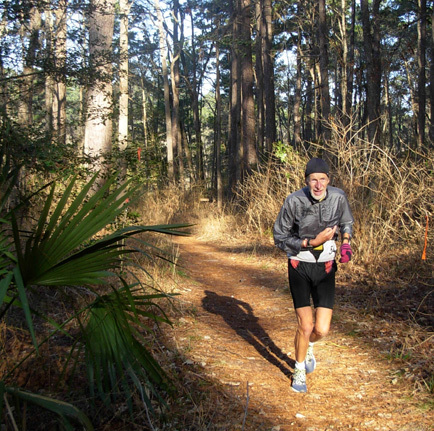 After Jim entered the race three weeks ago, he read everything he could find about it on the web site and in the ultra list archives. He knew where his drop bags would go, what the intermediate cut-off times are, when pacers may start, where crews can meet their runners, how the course is marked and laid out, where aid stations are, and other particulars. 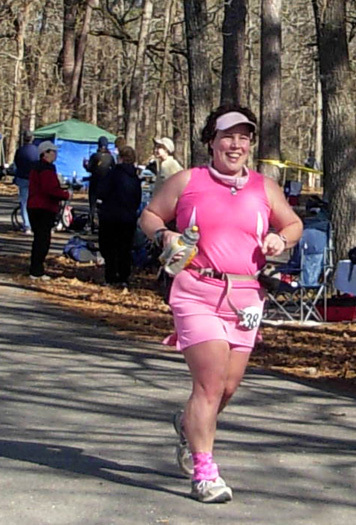 Previous race reports written by runners always have useful information, too. Jim picked up his race packet with his number, timing chip, and a nice pullover jacket the entrants received. We exchanged greetings and hugs with lots of friends, then listened as Joe and his assistants conducted the pre-race briefing. One of the best things about ultras is seeing old friends from all over the country -- and world -- that we may not have seen for several months or years, and making new friends. Before and during the race we met several people with whom we've corresponded by e-mail via the internet ultra list. It's always fun to put faces with names. Several folks introduced themselves to us and thanked us for this web site. We always appreciate that! One man told me he's starting his AT hike (run?) on April 29 and I'm so sorry I don't remember his name (CRS Syndrome again!). Although the Watts live and work in Colorado they manage to regularly run ultras all over the country. We saw them at ATY in December (AZ) and we'll see them again at Umstead in April (NC), Bighorn in June (WY), and maybe some other races later in the year. The pre-race dinner was next but we opted out. It's always nice when runners have the choice of paying extra for meals instead of including them in a higher entry fee. We chose not to spend an additional $10 each for dinner (which proved to have more runners than Raven Lodge could accommodate) or the post-race breakfast. After socializing with friends, we had our usual pre-race fare in our camper nearby. We made final preparations for the morning, and got to bed early. Since it still gets dark very early this time of year, falling asleep at 8:30 PM for Rocky was easier than trying to sleep the night before a race in the summer when the sun's still shining. No matter what time of the year, however, it's always tough to get up at O-dark-thirty to run a race! It was still dark at the 6 AM start, too. Jim was in good spirits as he got dressed and consumed some calories (he's not much of a pre-race eater, especially that early). Because of our proximity to the start/finish area and the limited parking near the lodge, we decided to walk about 2/3 of a mile to the start with a chair and a couple of Jim's drop boxes. Rather than leave his things at the aid station for a volunteer to retrieve every loop, we set up our crewing spot along the course leading to/from the turn-around at Raven Lodge. That would give us faster access to his drop boxes and more room to spread out. I was picking out a spot when Jay Batchen, RD for the Grand Teton races, invited me to use his race team's canopy. That was very generous and kept Jim's drinks and gels in the shade all day. Thanks, Jay and Lisa! I took the rest of our supplies, gear, and clothing on later trips to that aid station. Walking and running back and forth from the camper at least four times gave me a good warm-up for my pacing duties that evening! 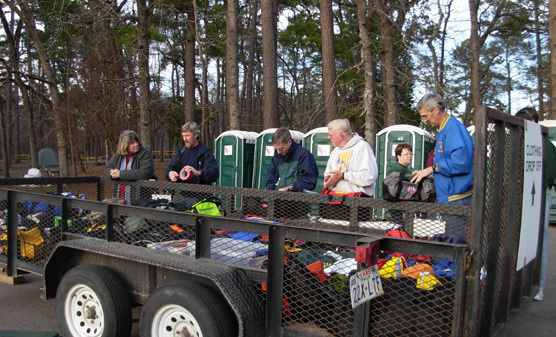 After the runners were gone on their first twenty-mile loop I could see the volunteers at the aid station who were trying to sort the 100-miler's drop bags by number were having a tough time of it. Fifty-milers were starting to add their bags to the mix, complicating the process. I helped the volunteers until my back started hurting from bending over so much. I could barely lift some of the heavier ones. What the heck was in them?? 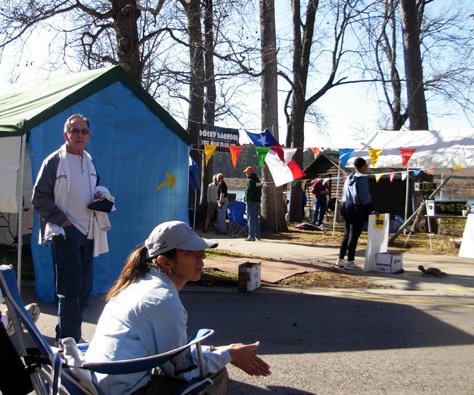 I was very glad Jim's boxes weren't in that tent, as were the other runners who set up along the course nearby. 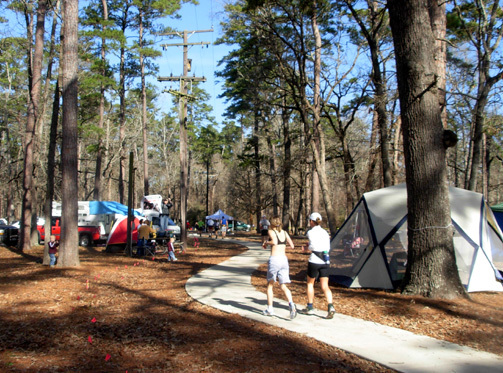 It was reminiscent of the Hinson Lake and ATY loop courses where runners can set up chairs, tents, and canopies along the course for their personal aid stations. Jim and I think the volunteers at Rocky did a fantastic job. We're always appreciative of that in our races and thank as many as we can. I'm not criticizing them or race management regarding the drop bag situation at the main aid station (so many bags, it would be hard to find and replace them each loop for over 400 runners). I'm just recommending that runners who are reading this put their bags, cooler, and a chair out along the course just before the start/finish for easier, faster access. If it's likely to rain, erect a canopy. 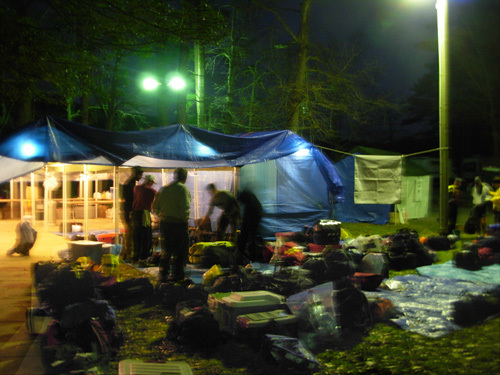 If you leave your bags/boxes in the tent at the aid station, just realize it'll take longer to get to them each time and there isn't much room to sit there to change shoes, etc. I didn't see the sun pop over the trees, however. 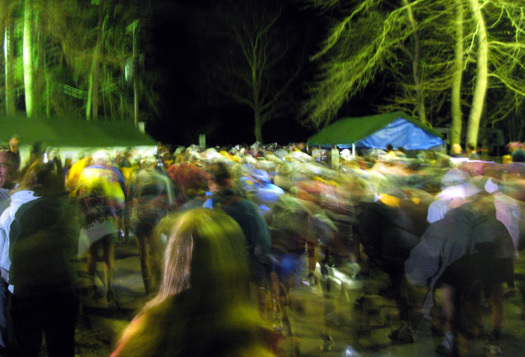 The 50-mile race was ready to start, and I needed to return to the camper to take care of the dogs, eat breakfast, and prepare for my crewing job. Jim had been running for an hour. I wondered where he was and whether he was enjoying himself . . . I wish Jim would write his own race reports. It's hard to write these things from the perspective of the runner when I wasn't out here running! If you are an ultra-endurance athlete, you know what I'm talking about! Slowly, inexorably, I start to unravel. The enormity of the task sinks in. Perhaps I ran that first twenty or forty or sixty miles too fast . . . Hmmm, these hills are getting longer on each subsequent loop . . . Gosh, I never thought 70 degrees could feel so hot! . . . My stomach's not feeling so good now and I've lost my appetite . . . I'd better check out that hot spot on my foot before it really starts to hurt . . . I can't sit down or I won't be able to get back up . . . I wonder if I can finish in time if I walk all night . . . If it's not one thing, it's another. A lot can happen over one hundred miles, even at an "easy" race like Rocky. Jim experiences many of the same problems and thought processes I do in races that last 26 or 28 or 30 hours or more. Little annoyances can escalate into major problems before we realize it, and sometimes it's too late to "fix" them. Sometimes we can overcome the obstacles and triumph over them, which is definitely more fun. There's a myth among endurance athletes that "it never always gets worse." Well, sometimes it DOES keep getting worse, and the only way we can make it better is to bail out. Unfortunately, that happened to Jim again during the night and I was there when it happened. Jim's race began well, as usual, and his plan went pretty much according to schedule the first sixty miles. He studied the splits of runners in previous races to help him figure out how fast he should run each 20-mile loop to finish in three target time zones: 25 hours (best-case scenario), 27 hours (reasonable goal), and 30 hours (absolute cut-off). About two hours after the race began I walked to the nearby aid station at Site 174, which is 17 miles into each loop. 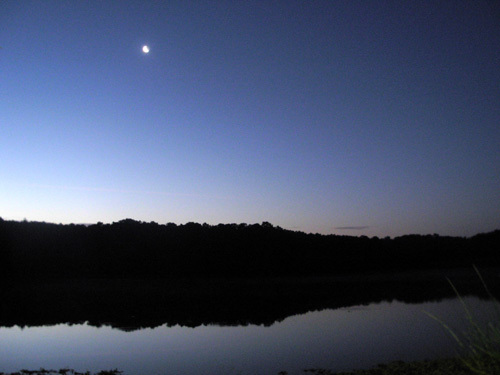 I took photos down by the lake (the three pictures above) and as runners came up the short hill to the aid station. I was surprised how fast some of the runners reached that point, and not dismayed when it took a while for Jim to show up. It meant he was pacing himself properly so he didn't go out too fast. He was happy to see me and said he felt fine so far. He had just three miles to the start/finish area where I'd see him next. I hustled back to the camper, got more of his crew gear, and headed for the main aid station. That was the first of four or five trips I made between the camper and start/finish, plus walking to two other aid stations, so by the time I began pacing him in the fourth loop I'd already put in eight or nine miles and lotsa time on my feet. It didn't take Jim long to go those three miles the first two loops. He finished his first loop in about five hours, right when he planned for all three target finish times. He deliberately tried to go a little slower the next loop, but ended up completing it in about the same time. 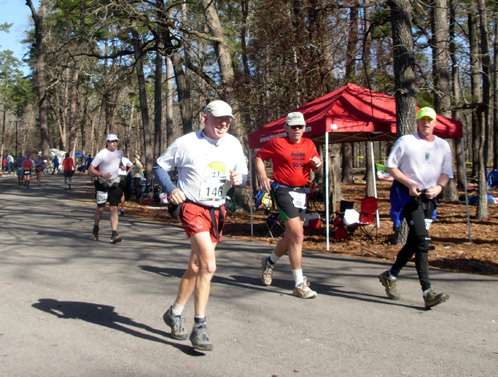 The two photos above show Jim (red shorts) to the left of several other runners coming into the main aid station at 20 miles; the fellow in the red shirt is Rich Limacher. Other runners are going outbound on their second loop. 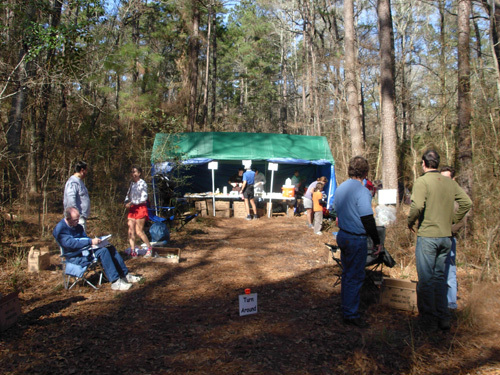 Notice the canopy, tents, and personal aid stations on the right. Our supplies were under anther canopy (not shown) that was closer to the aid station. That's not him in the photo above, but it shows part of the route near the start/finish area to the trail section that parallels the road to and from the lodge. Normally people don't camp this close to the lodge but it's permitted during this race. On the second loop I decided to drive out to the Highway aid station and surprise Jim. This aid station is located about four miles into each loop. By then it was warming up considerably (it would reach the mid-70s). This time of year much of the course is in the sun and I knew by 11 AM he was getting hot. I carried a cooler and crew box a quarter of a mile to the aid station in case he wanted something different than aid station fare, a bigger pair of shoes, whatever. I had fun greeting other runners while I waited for Jim. I always check to see if the volunteers need any help. If not, I'll ask runners if there's anything I can do for them. I like to be useful. This is another out-and-back section of the course. 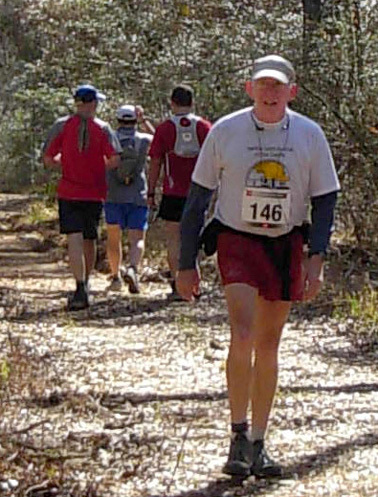 Pretty soon I could see Jim coming up the jeep road as other runners passed him going outbound from the aid station. He WAS surprised to see me there! I don't always tell him which aid stations I'll visit because "stuff happens" and I might not be able to get there on time. At Rocky I planned to be at the start/finish (main) aid station and the Site 174 aid station near our camper on every loop. By seeing him three miles before the end of each loop I'd know if I needed to get something from the camper to give him at the main aid station. It was on a whim that I went out to "Highway" the first time. Those are the only three of five aid stations where crews can go to see their runners. I saw Jim again at 37 miles (Site 174) and at the start/finish at 40 miles. By then it was about 4 PM and he was a little fried from the sun, heat, and humidity. He was slightly ahead of his schedule for a 27-hour finish and was still optimistic about finishing the race. Jim returned to the course for his third loop. His feet were starting to hurt and he wanted a different pair of shoes than he had at the main aid station. I returned to the camper, got the shoes, and drove out to "Highway" just in time. By then (mile 44) he had changed his mind about changing shoes. That's OK. Been there, done that. Now it was time for me to get ready for my pacing duties. I planned to walk and run with Jim the last 40 miles. Pacers are allowed to start at any of the official crewing points after their runners have completed 60 miles (as in some other 100s, Rocky allows runners who are 60 and older to have pacers the entire way, but Jim won't be 60 until August). I ate my supper, finished getting my drop boxes ready, walked the dogs, and got dressed to run. After watching everyone else run all day, I was excited to be getting out on the course, too! I love running and walking at night and it would be fun to hear more details about Jim's race and encourage the runners we saw. But first I needed to see Jim again at 57 miles so I'd know if he needed me to get anything from the camper for him to use at the main aid station after his third loop. It was already dark when I walked up the hill to the nearby Site 174 about 8 PM. I had barely sat down near the aid station when I realized they were seriously under-staffed. There was one timer and only one man trying to keep the food and fluids ready for the runners, some of whom by now needed or requested more assistance than earlier in the day. 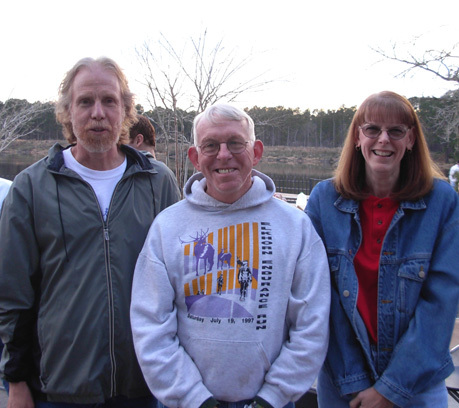 When I volunteered to help, they were grateful. I worked with them (and a young lady who showed up later) for about 45 minutes until Jim came in. The other problem I noticed at this aid station was a temporary lack of food and drink while I was there. They ran out of the race's energy drink, Hammer Nutrition's Heed, and didn't have much besides water to offer the runners to drink. They were also out of soft drinks, ginger ale, bread for sandwiches, turkey, and cheese. Perhaps they didn't plan to serve sandwiches all night. There was a little bit of Sammy Voltaggio's delicious chicken noodle soup and some cold meatloaf left if anyone wanted protein. The supply of snack foods (crackers, chips, candy, etc.) seemed to be adequate. That was a surprise to me because the race enjoys a good reputation for its volunteers and aid stations. Fortunately, this was the only time Jim ran into a problem with any of the aid stations not having something he wanted (Heed) and he made do with what was available. 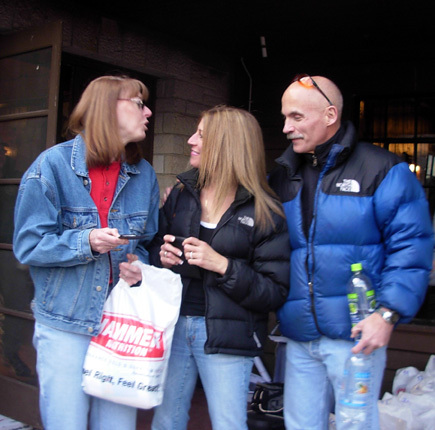 Jim said the aid stations at Rocky offered standard ultra race foods and fluids and the volunteers were great. After being totally spoiled at ATY it was a bit of a letdown, but much more typical of the ultras we run. We think race management and the volunteers did a great job overall, considering the large number of runners. They really do take care of you at Rocky! When Jim came in I quit my impromptu volunteer job and assisted him in changing into a larger pair of shoes and finding something to eat. I was glad I took the shoes there, although by that point it was too late to prevent blisters; they were already developing. Jim had about three miles to negotiate to the main aid station and I assumed he'd run some of it. I got his boxes and hustled back to the camper, let the dogs out to pee just one more time, grabbed my own two drop boxes for 40 miles of running, then walked as fast as I could back up to the start/finish to wait for Jim . . .
. . . who took nearly an hour to get there! I didn't have to rush as much as I did that time. That was my first real warning that he was unraveling. Jim came into the main aid station about 10 PM (16 hours into the race) right on his schedule for a 27-hour finish, but he needed to attend to his sore feet. That process took about thirty minutes. The medical tent was crowded when we were there and we had to wait several minutes for help from one of the medical volunteers, but we thought that was preferable to doing the job ourselves in less-ideal conditions. The camper was too far away and our canopy area wasn't bright enough. When it was Jim's turn, an EMT was able to pop one blister, disinfect the area, and tape it up, but he couldn't get any fluid from the other toes that hurt. Jim later found blisters under calluses on both little toes (blisters under thick skin are very difficult to drain) and another one on his heel that wasn't visible in the medical tent. After Jim put on clean socks and his larger shoes we began running Loop 4 at 10:30 PM. He had 60 miles down and "only" 40 to go in 13� hours. Despite his increasing foot pain, he still verbalized optimism about finishing. He had enough time in the bank to walk fast all night, run and walk after the second sunrise, and still finish under 30 hours. YIPPEE! I GET TO RUN!! Neither one of us runs much at night in a 100-miler because we're too tired by then and it's hard to see the rocks and roots. Jim's more coordinated than I am, but he's had his share of face plants. It was very dark on race night, a few days before the new moon. Clouds had rolled in, too, and some light rain fell before dawn. One of our flashlights became too dim to be of much use within a few hours, even after changing batteries; we both had spare lights, so we were good to go. We could see well enough to run here and there, but it was mostly a long walk. It was warm and humid during the night, getting down only into the mid-40� F. range. That was comfortable for us in shorts and light jackets. Unlike ATY, where Jim had problems with hypothermia, he stayed warm throughout the night at Rocky. After dark he wasn't eating and drinking as much as earlier, but he did better than in some races where I've paced him. His alertness and sense of humor remained intact as we walked as quickly as possible (and did some downhill running) the first few miles of his fourth loop. Everything looked different to us now that it was dark. That probably helped Jim mentally because he's not a big fan of loops. 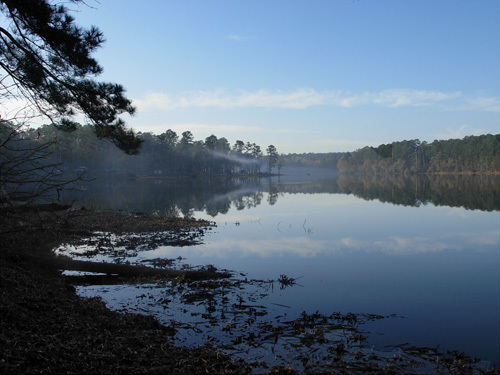 For reasons that are difficult to explain, the short loops at ATY and Hinson Lake don't wear on our brains like the longer ones at Rocky and Umstead. It has a lot to do with "instant gratification" when we see our progress after each very short loop. Jim loved the terrain and trail surfaces at Rocky, just not the thought of going back out each time on the big loops. I was so hyped up about finally getting to run and walk that I thoroughly enjoyed the hours in the dark. Our field of vision is limited by the length of our flashlight beams, so our other senses become heightened. 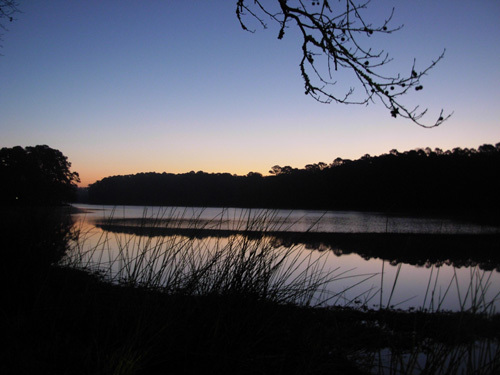 For example, we always become much more aware of sounds at night, although the frog chorus at Rocky around the lake and through the swampy areas would have awakened the dead even in broad daylight. Cool. 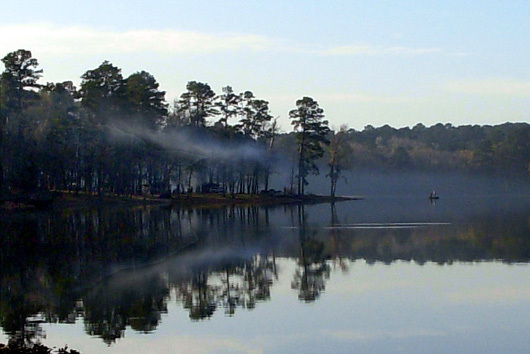 It reminded us of the frog chorus at Hinson Lake in North Carolina. They must learn the same froggy songs in Texas! After a few miles it became obvious to me that Jim was more fatigued than I realized back at the last two aid stations (Miles 57 and 60). Sections he'd run at a good pace during the day now took seemingly forever in the dark and it was discouraging to him. Although he was naturally fatigued this far into the race, the main problem seemed to be his sore feet. It was painful for him to even walk fast any more, let alone run the downhills. He kept plugging along and pretty much blew past both the Highway (64 miles) and Dam Road (67 miles) aid stations, knowing the longer he stayed the harder it would be to leave. He just wanted to get done as quickly as possible. I thought he should be taking in more fluids and calories, but I know when to stop pestering him about that. His energy level seemed satisfactory; it was the foot pain that was debilitating. We were both impressed with the volunteers and food at the Dam Road aid station. 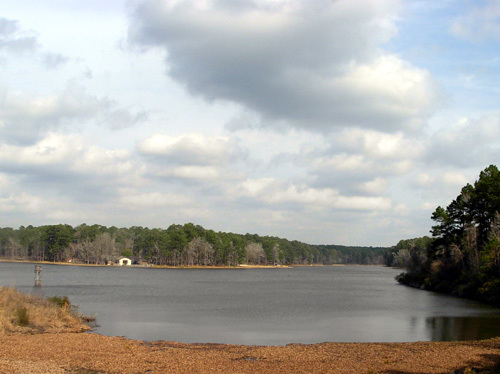 Runners pass Dam Road twice each loop at 7 and 12.7 miles. I saw it only twice but Jim was there eight times. 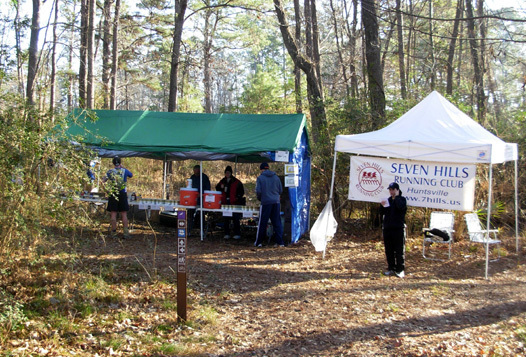 It's the only other drop bag location on the course besides the main aid station, so it's the second most "full-service" of the race's five aid stations. Volunteers are able to drive in supplies on a jeep road but crews aren't allowed to access this aid station or the next one, which is called Far Side (because it's the farthest from the lodge, on the "far side" of the lake?). From Dam Road it is just under three miles out (then back) on a rutted jeep road to the Far Side aid station, but as we trudged more and more slowly toward it I didn't think we'd ever get there. And we didn't. Jim was busy doing the math in his head on this stretch and decided he no longer had time, at this pace or slower, to finish the race on time. Instead of plugging on until he ran out of time and got pulled, however, he had so much foot pain that he just decided he was done. Period. He completely lost his desire to continue forward. He turned around before reaching Far Side. I tried my best to get him to go on to the turn-around, hoping he'd feel better later on -- that "never always gets worse" stuff. But he'd already decided it wasn't going to get any better, ever, and he wanted to stop hurting sooner rather than (much) later. We figure we got at least two miles out from Dam Road (probably more) before turning around. That would have been 69+ miles. It was a slow hike back to the Dam Road aid station but as soon as he turned around, Jim's attitude brightened. Although he was discouraged he was relieved to know he could get off his feet soon. I was frustrated on various levels and concerned about what another DNF would do to Jim's psyche. I thought a finish was fairly certain, and suddenly it wasn't. He'd been thinking about dropping out for several hours, but it was a surprise to me when he announced he was "done." He had been in more pain than I realized. We both have a pretty high tolerance for pain -- we have to, to run these things -- but we have our limits. I think we got back to the Dam Road aid station about 1 AM. Since Jim hadn't reached the Far Side, he dropped out officially here, getting "credit" for only 67 miles (first time through the aid station on this loop) even though by now he'd gone 71 or 72 miles. And to his great dismay, he wasn't near done walking yet. 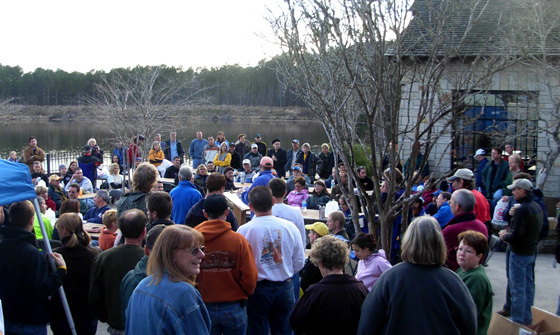 It would be several hours before any of the volunteers could drive us back to the lodge. They had a job to do. Since crews couldn't come to this aid station, there was no one else with whom we could catch a ride. 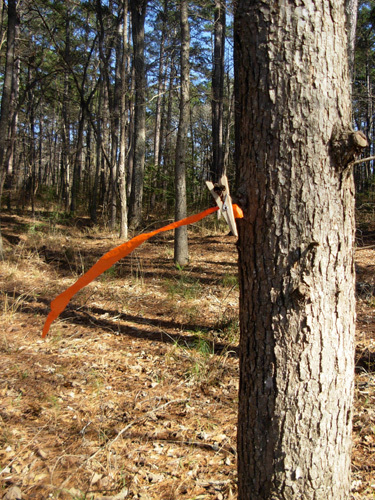 Our choices were limited to 1) sitting and waiting several hours or 2) walking back about four miles to the lodge via a bit of a shortcut on the service road and backwards on the Chinquapin Trail (race course). Later we realized there was a little shorter way, but we didn't know about it at the time and we might have gotten lost in the dark on an unfamiliar trail. After officially dropping out, Jim's attitude improved even more. It was like a big weight had been removed from his shoulders. His relief was palpable. He got some food and drink and talked for a little while to AS Captain Lynn Ballard about Hardrock before we started walking back to the start/finish area. It took us over an hour to walk the distance in the dark and it seemed even longer than that. We remembered some parts of the trail but it looked completely different going the other way. Some oncoming runners thought THEY were going the wrong way, but we reassured them they weren't hallucinating. We finally got back to the lodge area, made sure the timers knew Jim had dropped out, picked up some of our gear, and walked another 2/3 mile to the camper. That gave Jim a total of 75-76 race miles plus one and a third miles to and from the camper. I had gotten in 8-9 miles crewing and only 15-16 miles pacing. Bummer for both of us. Still, the beckoning bed looked mighty good at 3:30 AM and we slept soundly for several hours. The official end of the race was noon Sunday. The awards ceremony began at 11:30. Jim wasn't interested in explaining what happened to him umpteen times to our friends, so he opted out of the ceremony. I decided I didn't want to explain it either, which I now regret. I wish I'd attended anyway, as I've done at Leadville and Bighorn and other races where one or both of us failed to finish. It would have been fun to socialize with our friends and share "war stories." You can check the race web site for results: http://www.tejastrails.com/Rocky.html As mentioned at the top, only 66% of the runners finished the race under 30 hours, the second-lowest finish rate in sixteen years. Jorge Pacheco was the first man in 14:12:21 hours, very fast but not a new course record. 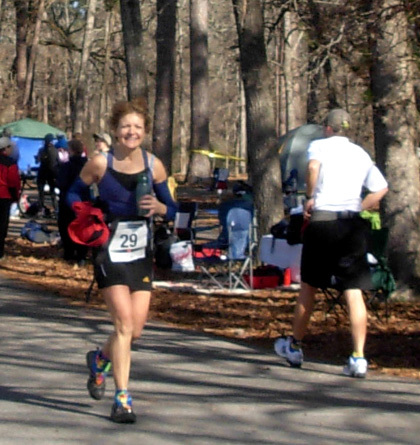 Jen Davis was the first female in 20:01:59. Some of our friends finished, some didn't. I know every one of them gave it their best shot, just like Jim. During the ceremony I drove the truck to a parking spot as close to the lodge as I could get and retrieved the rest of our gear from Jay and Lisa Batchen's tent. 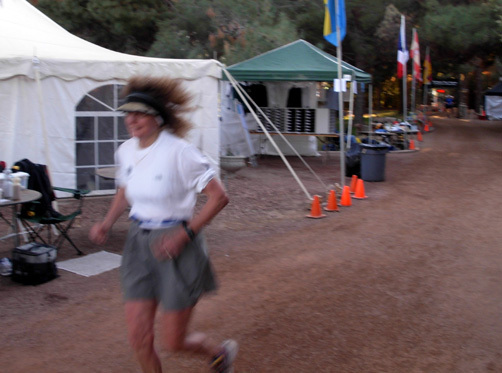 I watched as a couple of late finishers came in to the cheers of runners at the awards-ceremony-in-progress, talked to a few runners milling around the finish area, and returned to the camper to begin the tedious process of cleaning everything up and re-organizing it. Between the two of us, we were able to lance and drain the three blisters that weren't ready to be found in the medical tent. That brought more relief. Jim soaked his feet several times in Epsom salts and kept his legs propped up most of the afternoon. His appetite and thirst returned to normal. We both took a long nap Sunday afternoon and slept soundly again that night. Jim's feet were still sore this morning (Monday) but they are improving after minimal walking around. 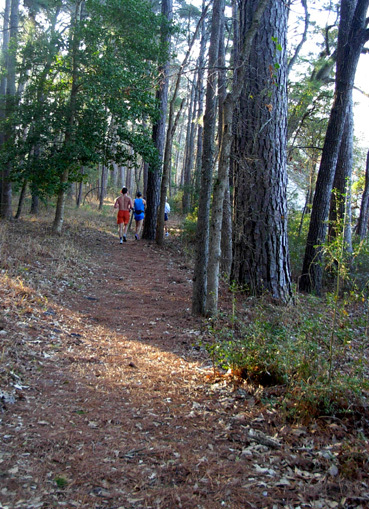 I enjoyed my last run in Huntsville State Park very much despite the 79� F. "heat wave" today -- or maybe because of it! You can't beat a warm, sunny day in early February. Cody was happy to be free to run again. I had to watch that he didn't go swimming anywhere -- the unseen alligators, remember? The egrets and herons were out in droves. Our "duck dog" (a Lab who's not trained to hunt) pays scant attention to waterfowl, so they were safe out in the marsh. I'm glad we decided to stay one more day at the park to relax, take another afternoon nap, and enjoy the nearly-empty campground after all the other runners went home yesterday. I didn't see anyone on the trails or out on the lake today. I assume most folks had to be back at work or were traveling home. Jim was kind enough to drive to nearby Huntsville to do laundry and "run" errands while I ran around the lake. We took one last walk after supper to enjoy the sunset and stretch his legs some more. I guess I don't need to worry so much about Jim's psyche. He's already talking about the training he needs to do to finish Umstead in April and Bighorn in June . . . I love it! Real ultra runners never give up hope for the next race.